If you follow my Instagram, (@fortheloveofexperience), I’m sure your annoyed by my excessive foodie posts lately. Sorry, not sorry. Food is absolutely, hands-down, 247% my favorite aspect of culture. Well, I’m sure glad you asked, because it’s food is exactly why. At its most bare assessment, food is merely nourishment, sustenance for our hard-working bodies that we thrust out into the world each day. At its most meaningful, it is a collection of the finest ingredients combined in a manner that reflects the depths of our memories, our experiences… our histories. I can assure you that the way I prepare my taco meat is much different than the way you prepare yours; we all have our staples, and they are staples for a reason, no? When it comes time for us to roll on back to ‘Ole Lady Liberty, I am certainly going to miss the cuisine on this darling island. Noodles, and dumplings, and yakiniku, oh my! We sat down at a nice little ramen shop in the heart of American Village (an arcade-stacked, eatery-stuffed, souvenir-hawking parcel located on the Chatan seawall). The kitchen couldn’t have been more than 20 feet long, with a thin sheet of two-foot high plexiglass serving as a splatter-shield between the barstool customer and the cook. The air was dank with grease, and the walls were covered in sun-faded kanji signs marketing spectacular dinner specials. I ordered the first bowl of ramen I could point to on the menu, with a side of gyoza, and a tall water. It was small. It was cheap. It was new (to me), fresh cuisine. It was perfect. 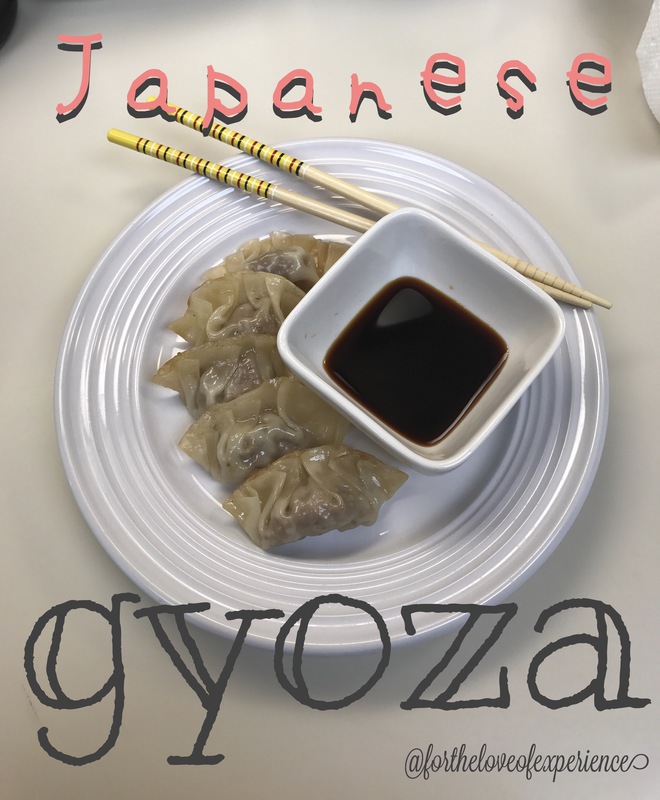 I just couldn’t stop thinking about that gyoza. It was such a different, yet familiar taste. So with that, I drove first to the commissary, then to off-base grocery, in search of the materials to make my own. 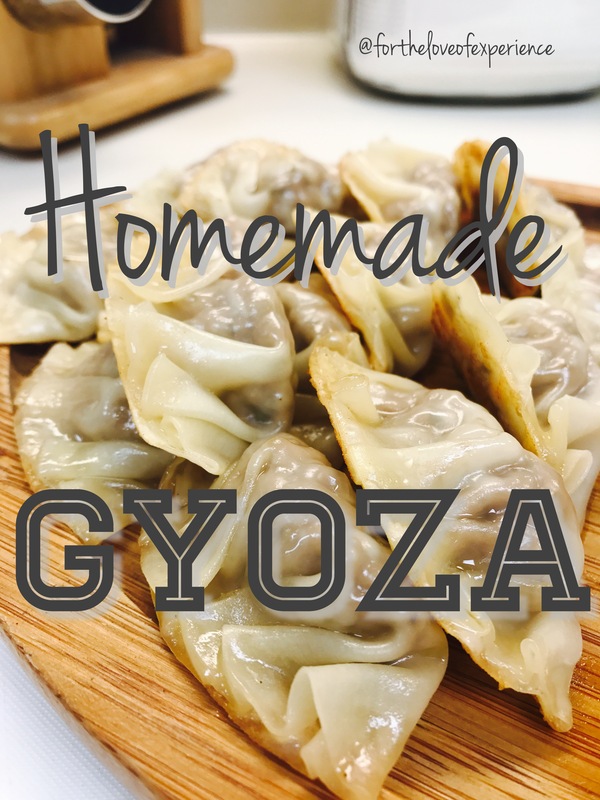 At its essence, gyoza is a Japanese dumpling. It is a wonton wrapper with pork (or chicken, or beef, or fish) that is seasoned and mixed with cabbage, chopped bean sprouts, carrot shavings, or any other bits and shabs. Its pan-fried on one side, and the top is steamed for a soft, smooth appearance before submerging it in a bowl of soy sauce. Yum! Grab a medium-sized mixing bowl, and empty your ground pork from its package. Use a fork to mash up the strings and smooth the pork out a bit, and then add in each seasoning (garlic powder, onion powder, paprika, salt, pepper, and parsley flakes—or whatever you’re into!). Use a fork to mix the ingredients in, stir it up well, and then set it off to the side. Lay out your first wonton wrapper, and scoop about a tablespoon, or just a bit less, or the pork mixture into the center of the wrapper (you can squish it into a ball if it will be easier). Note: Depending on which wrappers you buy, you may need to increase or decrease the amount per wrapper. You should be able to close the wrapped and have about ½ -inch of the wrapper touch without being affected by the mixture! Dip the tip of your finger in the water; you are going to draw a line with your finger along the rim of HALF of the wrapper. ONLY HALF; like here in the first photo below Step 6, you should only wet from the tip of my middle finger to the tip of my pinky finger. Just half the rim! Or the wrapper will be saturated and won’t stick! Repeat on the left side of the wrapper, and set it down when finished. Repeat until your wrappers or gone or if your mixture runs out. Heat a skillet on just-less-than-medium heat (legitimate measurement) with 1 to 1 ½ Tbspns of sesame oil. You don’t need much at all—you don’t want the pan bottom to be covered, or it will completely fry the wonton wrappers and they will be thick and crunchy (bad). Also get out a lid to cover the skillet for later. Lay about half of the gyoza in the skillet. (I pick the skillet up and shimmy the gyoza around, to make sure each one touches a bit of oil.) Do not cover! Let them cook for about a minute before you pick them up to check. When you do check them, they should have light golden-brown char lines on the bottom. DO.NOT.FLIP. Take that ½ cup of water we were talking about earlier, and add just enough to the skillet (careful not to slosh or pour too quickly—grease fire!!) to cover the bottom and cause bubbling. Immediately cover with the lid, as this will steam the top of the gyoza and complete the cooking. Allow to steam for about 3-5 minutes. They will be shiny and appear almost gummy-like in texture. This means they are done. Have any opinions? Comments? Concerns? Suggestions? Just plain freakin’ loved it? Tell me below! What are some of your favorite dishes? I’d love to hear! I know I won’t always be here, but I’ll never forget my first meal in Oki, and for the love of experience, I just had to learn to make it so I could have it whenever I wanted it. Oh my gosh, please!!! I would love to know how it came out for you! This is definitely a favorite in our house–even for my toddler! Oh my gosh!!!! You are the sweetest thing!!! Thank you so much!! Of course! I can visualize your future adventures wherever your blog may take you and I would like others to see the beautifully honest and genuine moments. Jeez, thank you! I can’t stop saying that, lol! I’m actually in the field right now, but I plan on digging through your blog a bit more later. I love that you took the time to create a logo. I definitely need to do that. And you’re just so raw. I love reading someone’s thoughts knowing that is exactly how they would say them. I write the same way! Thank you very much! 😀 How you described my blog is the same reason why I enjoy reading your blog so much. Continue to write on! Hey just found your blog today. I really like the variety of posts here. I love food too. Although it makes me fat andcollects around the stomach area but other than that its all awesome:) keep posting good work. OMG STOP IT! I would eat all of those in 2 seconds. OMG I would eat all of those in 2 seconds!